“The brown creeper, as he hitches along the bole of a tree, looks like a fragment of detached bark that is defying the law of gravitation by moving upward over the trunk, and as he flies off to another tree he resembles a little dry leaf blown about by the wind." Creepers do exactly as their name would suggest, and they love the vertical life. They flit up to the base of a tree trunk , and as soon as they alight, they hop up the bark (or yes, creep), sometimes as though the tree were a set of spiral stairs. All along the way, they glean tiny invertebrates with their delicately curved bills. Once reaching a sufficient altitude, they fly off to another tree trunk to repeat the process again. 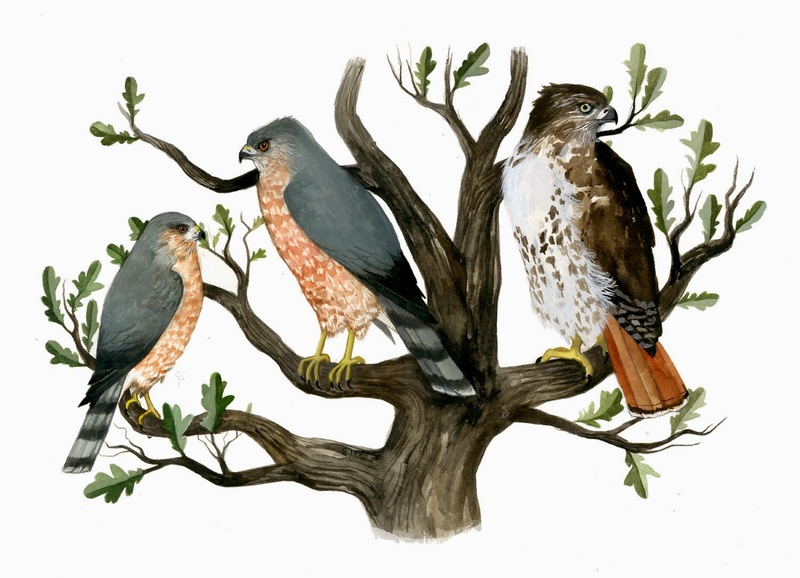 They tend to make their nests behind loosened flaps of bark on dead or dying trees. Their range reaches from Alaska, central Canada, all across the United States and as far south as Nicaragua. The Chicago area lies within their winter range, and so it is no surprise that I have had a couple show up in late fall. I expect, just as last year, they will be sticking around to tough it out like the rest of us. 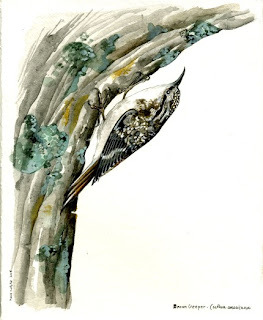 Wow, that's a great Brown Creeper painting! I saw my first Brown Creeper last year and it made my top ten lifers of the year. Those are really cool birds.